Today’s post is the first in a series I’m doing featuring Canadian food and recipes! Every country or culture has it’s own unique cuisine that make up it’s own particular identity. Canada is a country made up of people of various cultural backgrounds and traditions. I’m going to be featuring foods ranging from sweet to savoury that are part of our collective heritage! Is anything more Canadian than maple syrup? My girls have loved our sugar shack visits! Mid March every year in our neck of the woods is maple syrup season. 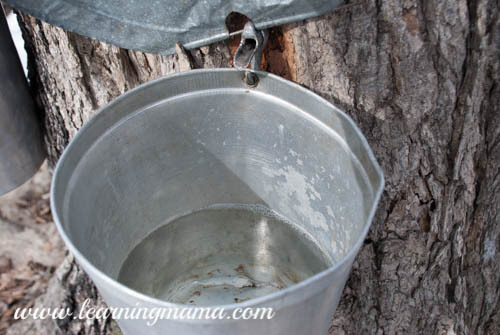 It’s a fun field trip to take the kids to a local outfit and start the day off with a pancake breakfast followed by a nice hike through the woods to see where the sap is collected each year. It’s great if you can find a place where the kids can participate and collect the little steel pails and bring it to the huge cauldron boiling over an outdoor fire. A maple syrup taffy demonstration is always nice too. There is no Aunt Jemima at our house. Never has been, never will be. We are a 100% maple syrup household! Nothing is better on pancakes and waffles (except maybe butter AND maple syrup). I also use maple syrup as a sugar substitute in many recipes. My usual salad dressing is equal parts olive oil, balsamic vinegar, and maple syrup. It makes a delicious glaze for salmon or carrots. We top our morning oatmeal with a dollop. My favourite maple syrup recipe by far is my Maple Butter Nut Granola recipe, which I will share with you today! My family loves this stuff! It is great on its own, with a little milk or served on top of yogurt. 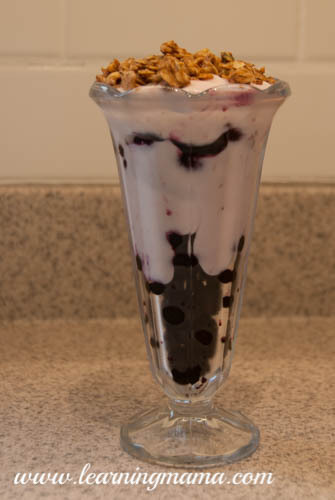 My favourite way to eat it is layered with frozen blueberries, yogurt and granola on top. Yum yum. So here’s the recipe! I usually double it, because everyone wants some and it makes a great gift in a pretty glass jar. This is going to make your house smell SO GOOD! Poor wet mixture over dry and fold with spatula until it is evenly coated. Spread on cookie sheet and bake at 325° until dry and golden, about 45- 60 minutes, turning/stirring every 15-20 minutes. There you go! 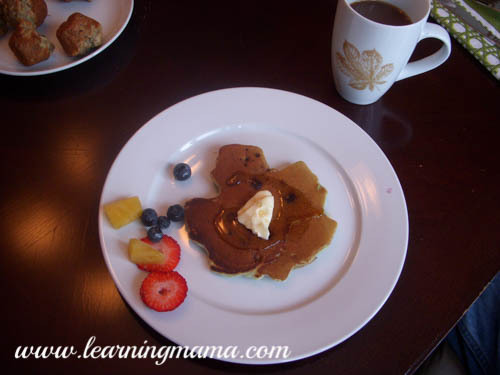 Now you can be a crunchy granola, homeschooling mama too!